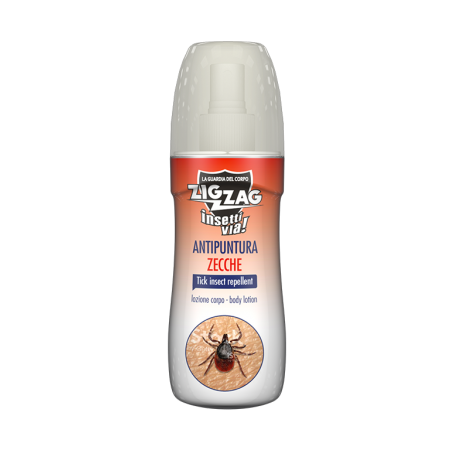 THE VAPORIZER ZIG ZAG RDNG2 ODORLESS is an insect repellent that defends you from the punctures of ZECCHE (Ixodes Ricinus) for over 5 hours. Provides optimal long-lasting protection even in critical conditions, such as marsh areas, during hunting, fishing, camping, trekking, etc. It is advisable to spray it in the parts that come into contact with the vegetation. Notes: Biocidal tests have shown that it works effectively for 5 hours, even against the Ticks of Wood (IXODES RICINUS), which is the most dangerous for humans. Spray the product from a distance of 10 cm on the skin of the uncovered parts of your body taking care to exclude the face and distribute evenly with your hands. For applications on the face, spray the product on your hands and distribute it taking care to exclude mouth and eyes. We suggest 3 sprays each for forearm and leg, up to two applications per day. Shake well before use. Do not apply more than 2 times a day. Spray the product into the parts in contact with the vegetation. Do not use on children under the age of two. It acts by inhibition of the nervous system and inactivity, bothering it and keeping it so far away.